This competition is the first for Omega Ruby & Alpha Sapphire and as such focuses on the new regional Pokédex. This competition gives a Hidden Ability Tyrunt for all players who participated in 3 or more battles. This competition is the second for Omega Ruby & Alpha Sapphire and as runs the GS Cup rules from the official ruleset. You can use any Pokémon in the National Pokédex barring Mythical Pokémon, but you are limited in that you can use up to two of Mewtwo, Lugia, Ho-Oh, Kyogre, Groudon, Rayquaza, Dialga, Palkia, Giratina, Reshiram, Zekrom, Kyurem, Xerneas, Yveltal or Zygarde in your team. The 2014 International Challenge February is the first International Challenge in 2015. This competition is open to people in all regions across the world and it runs the standard VGC Rules for 2015. This competition does not give Championship Points for Play! Pokémon players. The 2015 International Challenge April is the second International Challenge in 2015. This competition is open to people in all regions across the world and it runs the standard VGC Rules for 2015. This competition gives Championship Points for the top Play! Pokémon players. 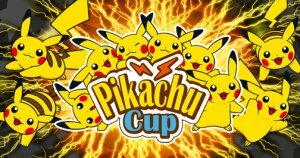 This competition is called the Little Cup and is only for Omega Ruby & Alpha Sapphire and is a Sinlge Battle competition. In this competition, you can only use Pokémon that are unevolved, but can evolve so Pokémon like Charmander, Pichu, Magby, Noibat etc. but not Charmeleon, Pinsir, Gyarados, Kangaskhan etc. All Pokémon are lowered to Level 5 for the competition and you cannot use the Eviolite item or the moves Sonic Boom or Dragon Rage. The 2015 International Challenge June is the third International Challenge in 2015. This competition is open to people in all regions across the world and it runs the standard VGC Rules for 2015. This competition gives Championship Points for the top Play! Pokémon players in each age group. Pokémon Restrictions: Legendary Pokémon Only. The Circle of Legend competition is a Rotation Battle Competition where you can only use Legendary Pokémon. Pokémon Restrictions: Electric-type Pokémon Only. This competition is the CoroCoro Challenge and is only for Japan, specifically only for elementary school age kids (born on or after April 2nd 2003). Players are separated in the matchups between East Japan and West Japan. The top 32 players from each bracket are then eligible to enter the Champion Decision Tournament at Pacifico Yokohama on November 8th for West or Osaka Intex on November 15th for East. This is the Primal Battle and allows for you to use National Pokédex Pokémon except for Mewtwo, Mew, Lugia, Ho-Oh, Celebi, Rayquaza, Jirachi, Deoxys, Dialga, Palkia, Giratina, Phione, Manaphy, Darkrai, Shaymin, Arceus, Victini, Reshiram, Zekrom, Kyurem, Keldeo, Meloetta, Genesect, Xerneas, Yveltal, Zygarde, and Diancie., but you can use Groudon and Kyogre in your team. Usable Pokémon: Rattata, Raticate, Ekans, Arbok, Pikachu, Zubat, Golbat, Paras, Parasect, Grimer, Muk, Gastly, Haunter, Gengar, Cubone, Marowak, Koffing, Weezing, Tangela, Mr. Mime, Ditto, Kabuto, Kabutops, Hoothoot, Noctowl, Spinarak, Ariados, Crobat, Umbreon, Murkrow, Misdreavus, Unown, Gligar, Granbull, Sneasel, Houndour, Houndoom, Mightyena, Dustox, Shiftry, Shedinja, Whismur, Loudred, Exploud, Sableye, Mawile, Gulpin, Swalot, Carvanha, Sharpedo, Cacnea, Cacturne, Seviper, Lunatone, Baltoy, Claydol, Shuppet, Banette, Duskull, Dusclops, Absol, Snorunt, Glalie, Drifloon, Drifblim, Mismagius, Honchkrow, Stunky, Skuntank, Spiritomb, Skorupi, Drapion, Croagunk, Toxicroak, Weavile, Tangrowth, Gliscor, Dusknoir, Froslass, Rotom, Purrloin, Liepard, Woobat, Swoobat, Venipede, Whirlipede, Scolipede, Basculin, Krokorok, Krookodile, Sigilyph, Yamask, Cofagrigus, Garbodor, Zorua, Zoroark, Gothita, Gothorita, Gothitelle, Frillish, Jellicent, Joltik, Galvantula, Elgyem, Beheeyem, Litwick, Lampent, Chandelure, Golurk, Zweilous, Hydreigon, Volcarona, Espurr, Meowstic, Honedge, Doublade, Aegislash, Malamar, Phantump, Trevenant, Pumpkaboo, Gourgeist, Noibat or Noivern. This is the Spooky Cup battle. It utilises various Pokémon deemed as scary in order to celebrate Halloween. It's a Double Battle competition and gives 10 Rare Candy if you participate in three or more battles. This is the Scrappy Skirmish and the winner of the recent poll for a Battle Competition. It runs standard VGC rules but with a twist. The most used Pokémon in recent Double Battle Competitions cannot be used.. This competition is unique in that matches will only last 5 minutes and you only have 10 seconds to select a move. You can only use 1 of your 6 Pokémon in each battle. Pokémon Restrictions: National Pokédex #001-#251. This competition is a Single Battle competition and allows for you to use any Pokémon in the Pokédex from #001 up to #251 excluding Mewtwo, Mew, Lugia, Ho-Oh and Celebi. Pokémon are lowered to Level 50 and you cannot have any Mega Stones. You can play up to 15 matches a day. Pokémon Restrictions: National Pokédex #001-#493. This competition is a Double Battle competition and allows for you to use any Pokémon in the Pokédex from #001 up to #493 excluding Dragonite, Mewtwo, Mew, Tyranitar, Lugia, Ho-Oh, Celebi, Kyogre, Groudon, Rayquaza, Jirachi, Deoxys, Dialga, Palkia, Heatran, Giratina, Manaphy, Darkrai, Shaymin, and Arceus . Pokémon are lowered to Level 50 and you cannot have any Mega Stones. You can play up to 10 matches a day. Pokémon Restrictions: National Pokédex #001-#649. This competition is a Triple Battle competition and allows for you to use any Pokémon in the Pokédex from #001 up to #493 excluding Dragonite, Mewtwo, Mew, Tyranitar, Lugia, Ho-Oh, Celebi, Kyogre, Groudon, Rayquaza, Jirachi, Deoxys, Dialga, Palkia, Heatran, Giratina, Manaphy, Darkrai, Shaymin, and Arceus . Pokémon are lowered to Level 50 and you cannot have any Mega Stones. You can play up to 15 matches a day.